The son of God, the devoted listener, and the dragon-charmer as painted by Johannes Vermeer. A tale of two bickering siblings hosting the son of God. This is one of Vermeer’s few religious paintings and, unlike The Allegory of Faith, people don’t tend to wish it didn’t exist. In the Biblical story, Martha asks Jesus to tell her sister to help her with the housework. Jesus responds by putting her down for focusing on the housework and serving food instead of listening to him talk like Mary is doing. Making sure your guest doesn’t starve is usually part of being a good host, but apparently not so much here. Both the religious subject matter and the focus on the figures alone without much of a background were pretty unusual for Vermeer. If not for his signature on Mary’s stool, it’d be hard to identify this as his work. Not much is known about his religious beliefs up until he converted to Catholicism to marry Catharina Bolnes. Likely his motivation went beyond simply impressing his mother-in-law; at the time, if he hadn’t converted, the Catholic church would have refused to recognize the marriage and instead compare it to a deal with the devil. The downside was that converting to Catholicism wasn’t exactly a way to gain popularity in Netherlands back then. A century prior, a fanatical Catholic had assassinated William the Silent, a leader aiming for religious tolerance for all, and Dutch Catholics were still cursed with the aftermath. Their churches were “hidden” and the only public offices they were legally allowed to hold were in guilds. Vermeer himself got elected to lead the Guild of Saint Luke twice. This scene was popular among sixteenth and seventeenth century artists but Vermeer puts a kinder spin on it than most others did. Typically Martha is depicted farther away from the other two and portrayed as bitter, scowling, or miserable. Instead, Vermeer paints the three as unified and gives her a smile, looking to be in high spirits as she talks to Jesus. It’s hard to imagine her voicing a heated complaint here unless she’s mastered the art of passive aggression. Unlikely for someone who goes on to become a saint. Vermeer’s complimentary depiction of Martha is fitting based on the tales of her later life in the Golden Legend. She moved to a village in France that was being tormented by the Tarasque, a creature often referred to a dragon, but was more aptly a grotesque patchwork of creatures. In short, it wasn’t pretty, and the villagers hated it. Martha sought it out unarmed and charmed it with prayer, but when she returned to the village with the now tamed Tarasque, she found that the villagers had a kill-first-ask-questions-later policy. They all received a harsh tongue lashing from Martha on their act of murder, as the Tarasque didn’t even try to defend itself. The villagers, either genuinely remorseful or scared of Martha, decided to rename the town Tarascon in its honor. For any tourists looking for an unusual French outing after they visit the Louvre, there's now a yearly effigy and festival to the Tarasque on the day of Saint Martha in the village. Janson, Jonathan. "Vermeer's Delft Today: The Old-Catholic Church in the Bagijnhof." Understanding The Astronomer by Johannes Vermeer. Accessed December 05, 2018. http://www.essentialvermeer.com/delft/delft_today/catholic_church.html. Lestz, Margo. "Saint Martha and the Tarasque in Provence." The Curious Rambler. May 09, 2017. Accessed November 20, 2018. https://curiousrambler.com/2016/06/09/saint-martha-and-	the-tarasque/. Wheelock, Arthur K., Jr. Jan Vermeer. Harry N Abrams Incorporated, 1981. Christ in the House of Martha and Mary is a painting finished in 1655 by the Dutch painter Johannes Vermeer. It is housed in the National Gallery of Scotland in Edinburgh. It is the largest painting by Vermeer and one of the very few with an overt religious motive. The story of Christ visiting the household of the two sisters Mary and Martha goes back to the New Testament. The work has also been called Christ in the House of Mary and Martha (reversing the last two names). 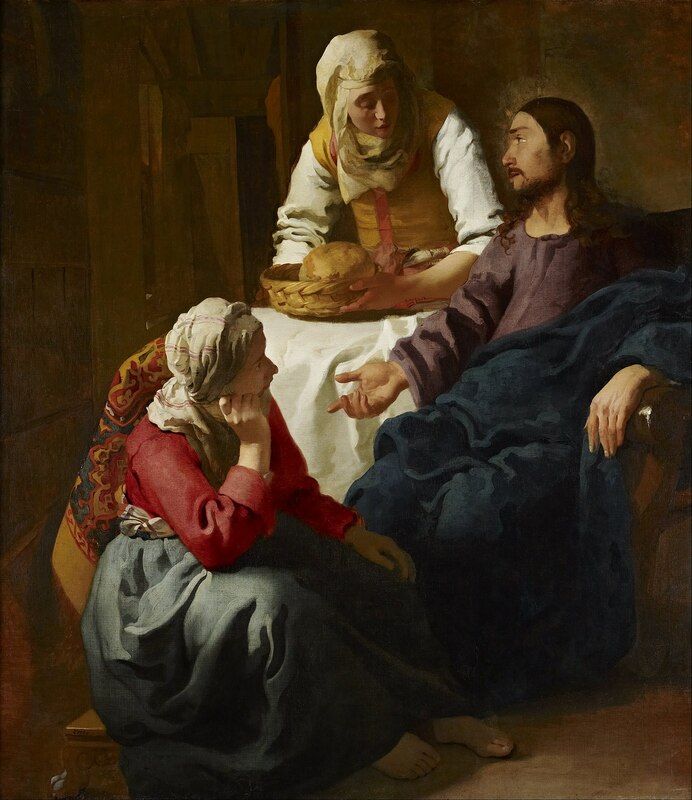 Check out the full Wikipedia article about Christ in the House of Martha and Mary (Vermeer).